For me, paintings are all about expressing the visual impact of experience – a feeling, a mood, a sense of awe and wonder of the world and our place in it – the world of the senses and the gift of life. Painting is all about color and shapes, texture and light, using the elements and principles of design to create a visual unity and the illusion of form. 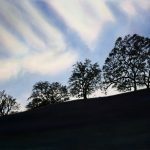 To create my paintings I use a variety of techniques that sometimes initiates questions about what methods I used to create them. 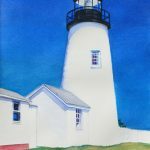 My paintings are often completed in my studio over many days and certainly hours of painting and decisions that I make over time in the quiet solitude of my studio or on location away from the bustle of everyday activities. It is both time consuming and timeless, for once the action of painting begins I am often lost in a space without time, more related to spiritual meditation than an activity shared with an audience. Therefore, she would rather show you a painting from start to ﬁnish in a demonstration. She would like to show you ﬁnished paintings and beginnings and demonstrate some of the techniques that she used to create them. I shall bring my materials and talk with you about them as I demonstrate particular techniques. I hope to bring to you answers to your questions and share with you the universal bond that artists enjoy. 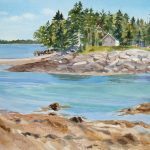 Sally Caswell is a New England artist noted for her en plein air drawings and paintings, resonant with color, that reveal her keen sense of observation, evoking a mood and a sense of place. 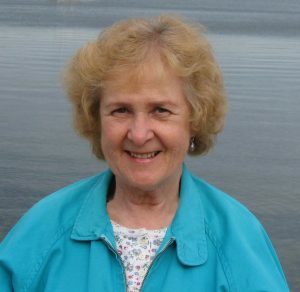 A Copley Artist of the Copley Society of Artists, Boston, a Signature Artist Life Member of the Rhode Island Watercolor Society, and Master Artist of Cape Cod Art Center. She holds an M.F.A. Visual Design/Painting with Distinguished Thesis, UMA/ Dartmouth; M.A.E.-equivalency, Ceramics Education, R.I. College; B.F.A. Painting and Illustration, Massachusetts College of Art.